With Summer approaching, no one wants to stand in a hot kitchen over a stove. With that being said, here is a salad that requires a sharp knife, a large bowl , serving plates and a fork. Not only is this salad healthy for you and gluten-free, but it is refreshing as well. You can use any type of fresh crab meat. I prefer Dungeness crab meat, and you can easily substitute the crab for cooked peeled shrimp as well. The basic ingredients for this classic dish from Ecuador is prepared by filling ripe avocados with a a crab salad, red onion, bell pepper, cucumber, radishes, lime juice, olive oil, and cilantro. Mix the cooked crab meat with diced onions, diced bell peppers, diced cucumbers, diced radish, lime juice, olive oil, chopped cilantro, and salt and pepper. The salad can be prepared in advance and kept refrigerated until just ready to assemble the avocados. Cut the avocados in half, remove the seeds and peel the avocados. Sprinkle each avocado half with a little lime juice to prevent the avocados from browning too quickly. 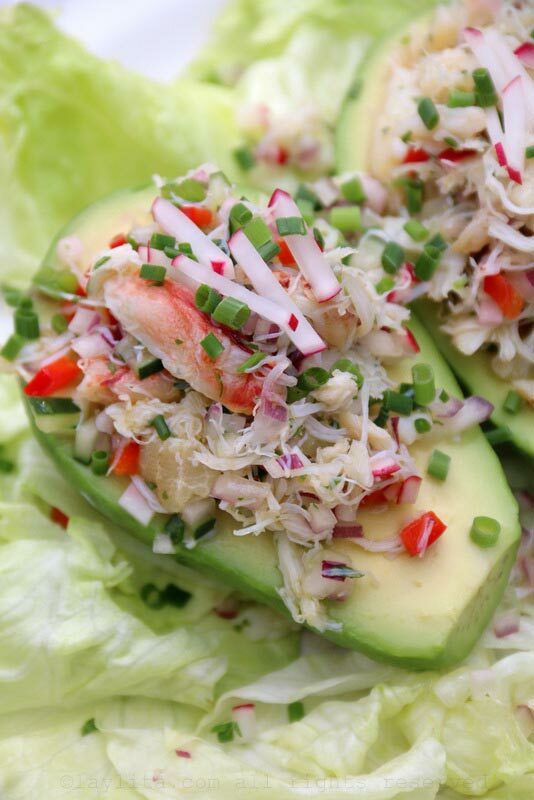 Fill the center of the avocados halves with the crab salad. Serve the crab stuffed avocados over lettuce leaves and garnished with scallions and radishes.